Naples, Fla. (June 16, 2018) – For a second consecutive year, housing activity during May demonstrated to broker analysts that May remained a standout month. Overall closed sales were remarkable with 1,024 closed sales during May 2018 compared to 1,027 closed sales in May 2017. Closed sales in May 2018 were higher than all months following May 2017. May also saw inventory levels continue to stabilize, according to the May 2018 Market Report released by the Naples Area Board of REALTORS® (NABOR®), which tracks home listings and sales within Collier County (excluding Marco Island). Closed sales of properties in the $300,000 to $500,000 price category during May increased 21 percent over May 2017, while closed sales in the $300,000 and below price category were just one sale short of the number of closed sales in May 2017. There was very good news for buyers in the report as May’s overall median closed price dropped 5 percent to $337,000 from $355,000 in May 2017. Moreover, the overall median closed price for homes priced above $500,000 decreased 14 percent to $507,000 from $590,000 in May 2017. On the high-end side of the market, despite an 11 percent increase in median closed prices, pending sales of properties in the $2 million and above price category increased 23 percent in May 2018 compared to May 2017. 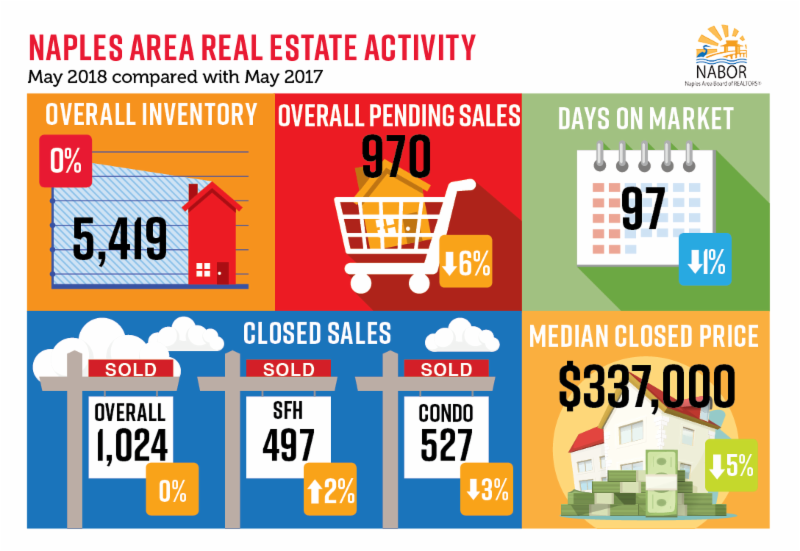 Overall inventory in May rose by 15 properties compared to May 2017. The report also showed inventory rose in May for both single family homes and condominiums priced below $500,000, which accounted for 58 percent of the available market in Collier County at the end of the month. Geographically, North Naples continues to be a shining star as the only coastal area in Collier County to report an increase in closed sales for May. Activity in the rural Ave Maria area has increased steadily over the last year; but in May, this area saw its single-family home closed sales skyrocket to 40 percent.